At 12, I got a camera for my birthday. I believe it was an old Kodak 110 with a flash cube on top. Remember those? I used to love taking photos but at that age, didn't really know what I was doing. I did practice, or at least that's what I thought I was doing. Waiting on film to be developed from the local drug store was torture. It seemed like an eternity waiting 3 or 4 days to get the final pictures into my grubby little hands. For the life of me, I never remembered what camera settings I had used, nor do I think I really cared. Ok, to be fair, I think the old Kodak 110's were fully automatic, but I did have to decide between which film speed to use. At about the same time; guitars, dirt bikes and cars entered the picture. All this took cash and with a limited allowance and savings, I had to narrow the field of my fun a bit. At the time, guitars won out over photography. Most of my money went towards the purchase of my first guitar, amp and strings at the age of 13. Shortly after this, I switched from guitar to bass guitar. I played in several local bands in the Wichita, Kansas area; Trinity, Critical Mass, MJ Project, The Dark and 69 Slam. Of which, The Dark had the most success during this time period if you want to call it that. The Dark placed 4th in the MTV Battle for the Basement Tapes. After the MTV Battle for the Basement Tapes in Wichita, several members of the band "The Dark" moved to Los Angeles and set our sights on the big time. Well, "The Dark" as we knew it never quite materialized in LA as we envisioned, but the drummer and I were able to land spots with the band "300". At the time, they were getting some airplay on the World Famous KROQ. The band "300" went through several personnel and name changes over the years; 300, The Local Group and finally, The Attachments. The band "The Attachments" showcased regularly at The Palomino, Bogart's, Club Lingerie, Madame Wong’s West, The Roxy, The Troubadour and even toured Europe for a short stint. I never have regretted my pursuit of music. Those were some of the best times of my life... in fact I still play and perform occasionally to this day. I do, however, regret not simultaneously learning about photography. I realized that I couldn't concentrate fully on both. In my head, I made up the thought of not being able to afford both film for my camera and strings for my guitar. That gave me an out. I'm sure that I could have, but hindsight is indeed 20/20. Fast forward to 2007; my Golden Retriever "Logan" was born. I purchased a Kodak Easy-share and started taking photos of Logan. This sparked the passion of photography that I remembered as a kid and has carried over to what I know and still learn today. I started taking Logan to Cambria, California which is a few hours drive north of Los Angeles. During Logan's first 5 years we visited Cambria, California about 4 or 5 times a year. Locals told me about a fairly secluded beach near Hearst Castle on San Simeon State Beach in San Simeon, California. My passion for ocean and seascape photography began. After receiving several positive comments about my photos of Logan at the beach, I dove in and began upgrading my camera gear. Not only was I having a blast with Logan, I started to realize how much I enjoyed photographing seascapes and being near the ocean. This time around, I learned more about my camera, shutter speeds, ISO, composition and light. To this day, ocean, seascape and nature photography is "where it's at" for me. Of course I do the occasional real estate or event photography shoot which is great too, but experimenting with long exposure and intentional camera movement photography without much pressure, is the fun part of it now. This is a different thing for me and I feel something that I have never felt before. I am at one with my camera and what is an always changing canvas that is Mother Nature. Not only does it energize me, I feel a connection spiritually and being somehow in sync with Mother Earth. This experience is "me, myself and I" with nature at it's best. There is no one else to count on. I never have to worry about the drummer or guitarist not showing up for rehearsal or to a show, it is all on me. Don't get me wrong, I do miss the guys in the band, those were some great times, but with photography it's at a pace that I enjoy, which makes me happy and if people enjoy my work, all the better. A couple of months ago I was contacted by Yahoo Incorporated out of Los Angeles, California. 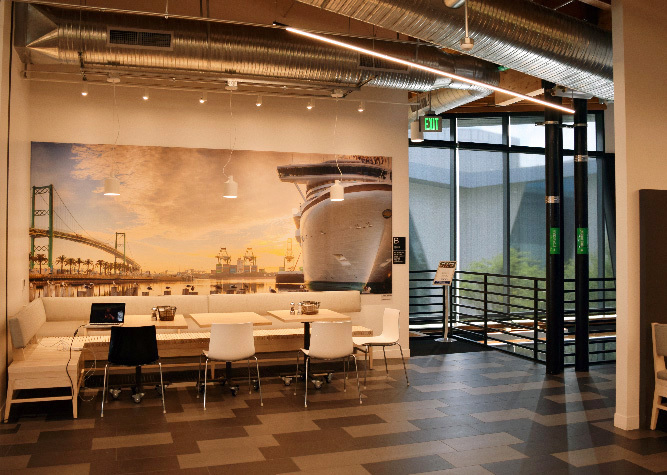 They were interested in a few of my images for their Playa Vista, California office. Today, I received word that the install is complete along with a couple of snapshots to share. Both are panorama photographs; one is located in the cafe and the other in the hallway. Top image is Port of Los Angeles and bottom photo is of Catalina Island. Was hoping to visit the Yahoo Los Angeles office during my scheduled trip to California in September. Unfortunately, that trip has been postponed, but I hope to see them in person very soon. Big thank you to Yahoo Inc.
Late last year I received an email from an artist out of California requesting permission to paint one of my photographs. It just so happened to be award winning artist Tony Podue. I was very excited and interested to see how one of my photographs would translate into a painted piece of art. How honored I was to have one of my images selected. Wow! After a few emails back and forth, Tony was off and painting. Just this month, Tony shared the painting with me via email and posted it to his San Pedro Gallery on his website. I was very impressed and thrilled to say the least. Just got word that a Giclee' of the painting is on it's way and I cannot wait to see it. Thank you Tony! The photo - Cabrillo Beach is in San Pedro, California and was one of my go-to places while living in the area. Cabrillo Beach in particular is in decent alignment to photograph sunrises and sunset seascapes throughout the year. Not too many places you can do that. The artist - Tony Podue is a second generation artist that prefers to paint in acrylics and oils. His artistic style of choice tends to favor photo-realism. 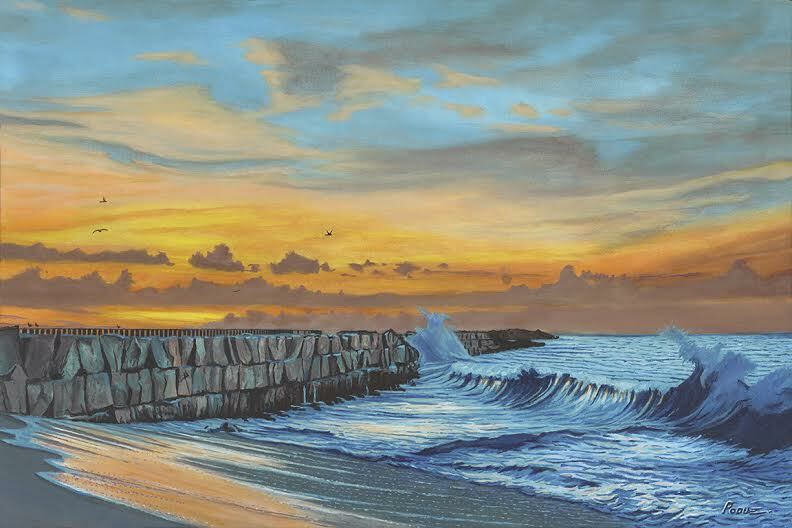 He is an award winning artist and has won more than 500+ awards in local, national and international juried art competitions. His art is part of several personal collections, and soon to be on permanent display in planned new museum which will be located in Los Angeles, California. Be sure to check out more of Tony Podue's work at www.poduestudio.com. The latest release by Long Beach, California based blues band, New Blues Revolution, "To Hellendale and Back" hit the streets last week prior to their performance on the NAMM kickoff party stage. NAMM is the largest music convention in the world. It's a privilege that my image was selected for the cover of the new CD. I shot the image during their set at The Canyon Club in Agoura Hills, California. To learn more about the band or pick up the new CD go to www.newbluesrevolution.com and connect with them on Facebook. Coming soon... Music and Sounds Page. There was a decent crowd on hand today at The Corner Store. Good people, blues music, and a craft fair. The weather this morning was a cool 39°, but it warmed up enough to be a pleasant day. The Alibi Blues Band was on hand and performed a couple a nice sets. Lots of good food, fun and the owner Peggy, was an excellent host. "That's so Pedro" was on hand to record a podcast for San Pedro's "what's happening" website. Met a few new people and some old friends came down to check it out. Thanks to everyone who came out, it was a fun event. I was happy to be a part of it.